• The secrets of the fruit, spices, and essential oils in Solomon’s locked garden. • A deeper meaning of these fruits, spices and essential oil essences in Scripture by studying different women in the Bible. • How others learn through their struggles and triumphs when you meet Cinnamah-Brosia and the women with whom she does life. • Encouragement to allow the Holy Spirit to cultivate the essence of courage in your heart. enjoy incorporating reminders of the fruit they represent into your life. 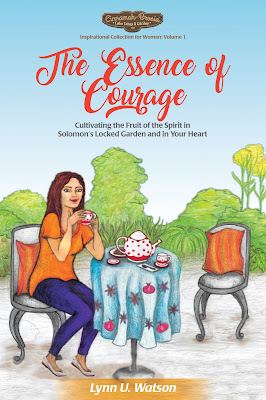 Disclaimer: I received a complimentary copy of The Essence of Courage by Lynn Watson for the purpose of an honest review. It was my pleasure to read The Essence of Courage by Lynn Watson. As a devotional, The Essence of Courage, ranks among my current favorites! Learning about the different spices, along with their biblical references, and of course, the stories of Cinnameh-Brosia’s friends made this a book incredibly interesting! I read The Essence of Courage more like a book, because once I started into it, I didn’t want to stop! After each offering, Ms. Watson included a selection that encouraged the reader to get more involved by making something including the spice, researching the spice further, or even decorating using the spice. It made the learning even more fun! The lessons learned from the Bible in The Essence of Courage are all from passages I had learned previously, but I’m quite certain the way Ms. Watson presented them will keep them fresh in my mind and easy to recall the next time the Fruits of the Spirit come up for discussion! It is with great pleasure that I offer The Essence of Courage by Lynn Watson five steaming hot cups of Room With Books coffee. “Ewww…. that smells like my closet floor with all my dirty clothes and smelly socks!” That was one young lady’s spontaneous reaction as my husband shared spikenard with his fifth grade Sunday school class. The day’s lesson: Mary anointing Jesus’ head. We can be sure the aroma of a full pint of the oil filled the room. Shooey!!! The cost – not the aroma – alarmed the disciples (especially Judas, the one who later betrayed Him for personal financial gain). The others’ concerns acknowledged the fact spikenard sold for a handsome price, and the money could help the poor. There was surely a better use for the resource than pouring a whole pint of expensive oil on someone’s head. Through my thirteen-year journey into the world of essential oils many years I saw plants, oils, spices, and fruits mentioned in the Bible in a whole new way. This book shares some of those fresh perspectives. What may seem an insignificant mention of a plant and/or its derivatives often carries more meaning. Creative projects or hanging with friends and family. I love that two of our grandchildren live close by. Getting started. The first sentence, paragraph, whatever page is usually awful. Just have to get some words on the paper. Then the creativity can emerge. Think it’s been in me for a very long time. My husband (of nearly 44 years) would always ask when I was going to publish my novel. I never saw myself as a novelist, but I believe the idea of a book has been there at least since high school. She may be a few years younger than Cinnamah-Brosia and look different as well, but that’s probably ok. I believe Candace Cameron-Bure would be a great choice. 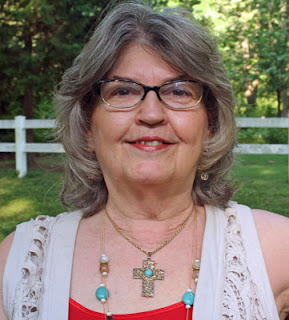 Pulled reluctantly into women’s ministry nearly four decades ago, Lynn Watson now treasures the opportunities that were provided to lead, encourage and mentor women through relationships and Bible studies. She wrote a few of the studies, too. Drawing from those experiences, along with years serving others professionally in the complementary healthcare field and her love for essential oils, Lynn delights in bringing her readers freshly inspired insights drawn from and focused on the many fruits, plants, oils, and spices mentioned in God’s Word. Married since 1973, Lynn and Steve call Bartlett, Tennessee home. Their home is filled with handmade treasures and lots of love for family, especially their five beautiful (of course) grandchildren. What a beautiful review. I’m so excited you enjoyed it so much! Thank you! Be blessed, Patricia, and may your heart flourish.